After spending a semester in Cambridge, England my junior year of college, I feel in love with scones. I would walk to the bakery and grab one for an afternoon pick me up. We have made several scone varieties in the past, such as make ahead cranberry scones and Triple Chocolate Hazelnut Scones Recipe to name a few. 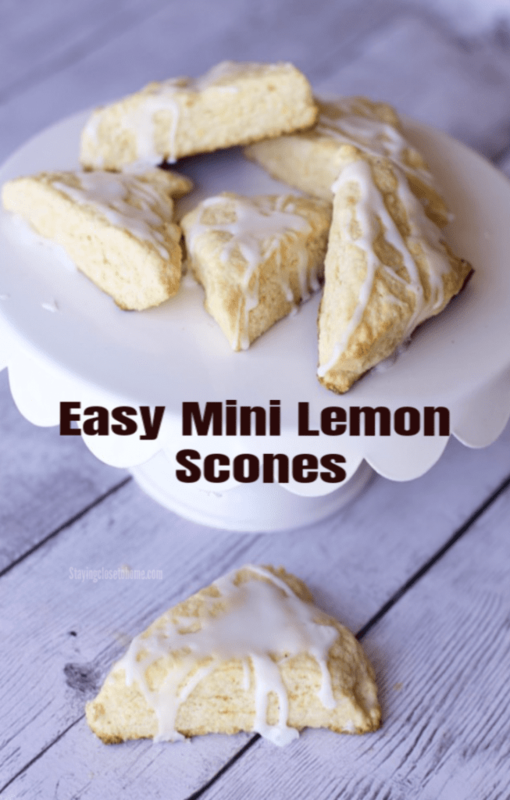 These Super Easy Mini Lemon Scones knock it out of the park for flavor and how moist they are. I adapted a recipe I found that uses pudding in their scone mixture. Not only does it add flavor, lemon in the case, but it definitely keeps the scones moist. 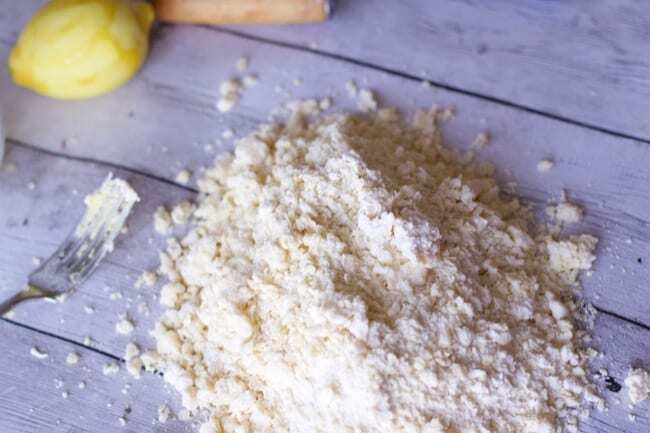 No hockey pucks with this lemon scone recipe. Don’t fear, there is lemon zest in the mixture as well as lemon juice in the glaze. 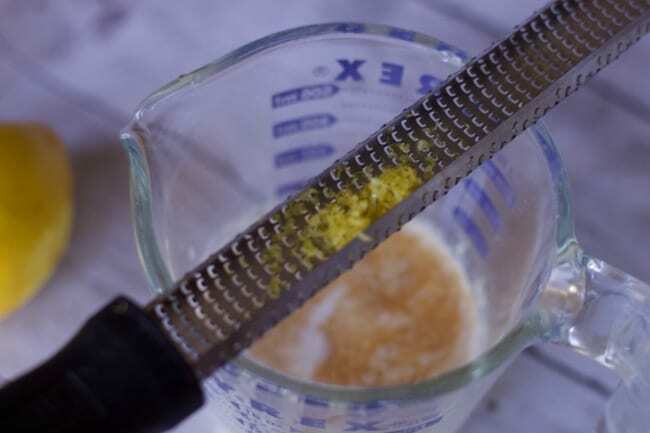 We don’t skimp out of true lemon flavorings here. 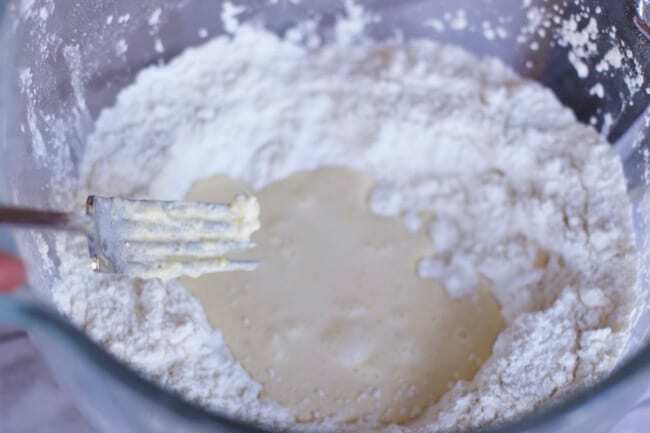 The key to a good scone, is not over mixing the batter. 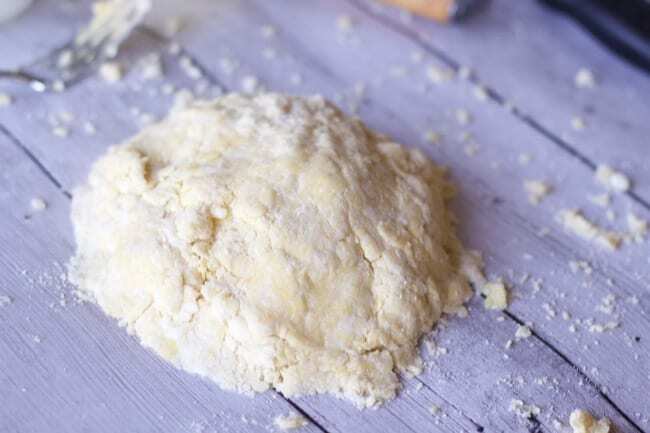 It is important to keep butter chunks in the dough to create fluffy and airy scones. Looking at this you may think, I need to add more liquid or keep stirring… DO NOT OVER MIX THE BATTER! It will come together when you lightly knead the scone mixture into a ball. We made these for a teacher appreciation brunch, so I wanted these smaller than the cranberry scones I made for a smaller brunch. 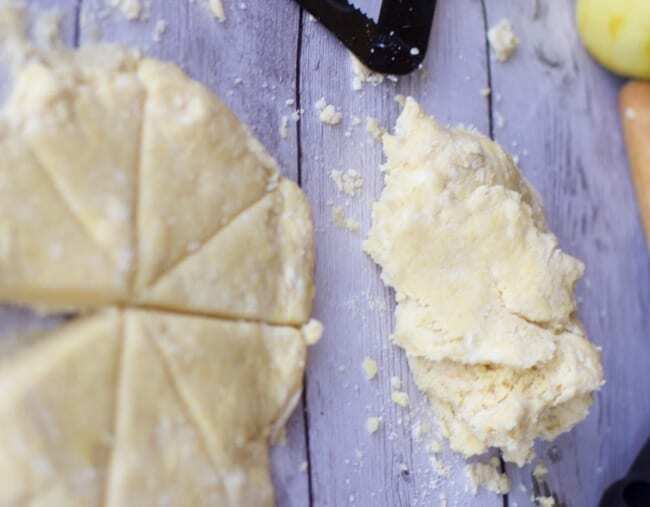 Simply divide the dough in half or even three times depending just how small you want your scones. 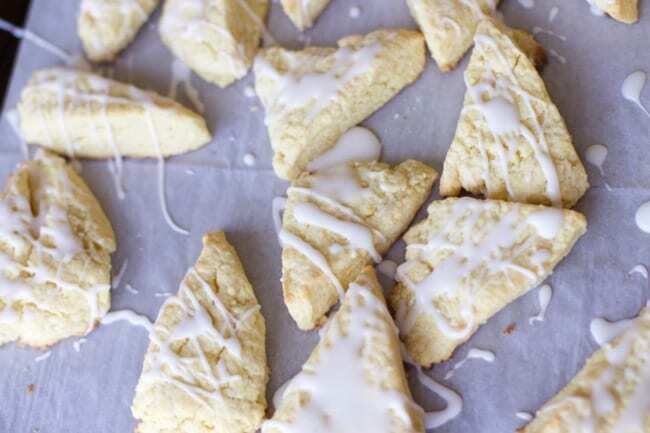 Slice each circle into 8 triangles and place on a baking sheet lined with parchment paper. This will make for easy clean up too. Be sure to watch the scones as they will brown quickly on the bottom. You don’t want to over bake your scones either!! Once they have cooled, make your lemon glaze and drizzle on top of your cooled scones. You can dip them too if you desire but I prefer the look for these a little fancier. 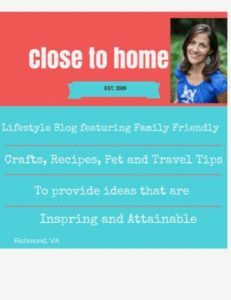 If you have never made scones, I would definitely give this recipe a try. Now that you know the secret recipe, the flavor combinations are endless. Next time I might use vanilla or chocolate pudding for a different variation. 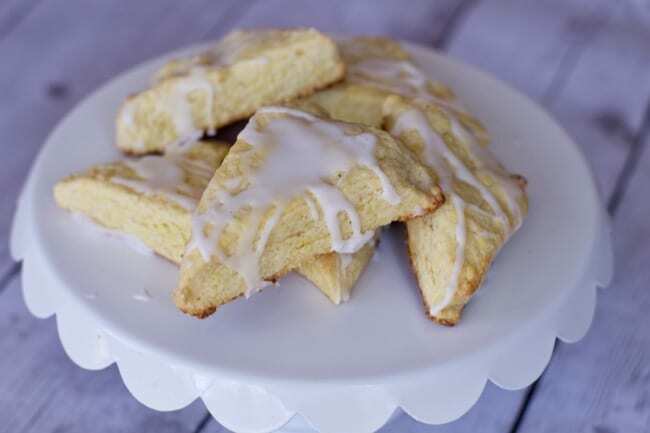 A refreshing lemon scone made with a secret ingredient to keep these scones moist. Place the cream, egg, vanilla, and lemon extract in a measuring cup. Whisk to combine. Create a well in the center of the dry ingredients and add the wet ingredients. Stir with a fork until just combined. See pictures to see it will still look dry. Turn out the dough onto a cutting board. Knead the dough a few times until the mixture comes together and is smooth. 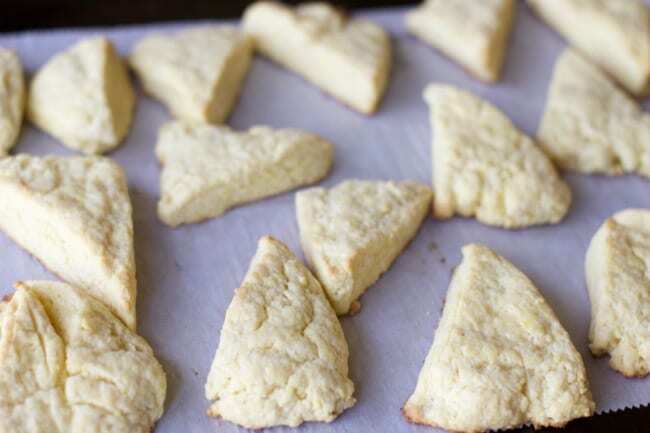 Place scones on prepared cookie sheet. . Bake for 8-11 minutes, or until the bottoms are just golden brown. Cool completely before glazing. To make the glaze: whisk all ingredients in a small bowl. Drizzle over scone or dip one side into glaze. .
Pin this when you are in the mood for some yummy scones.